I'm really curious about this one and had it highlighted as a WoW before! It's an end-of-the-world novel that is NOT about stopping the apocalypse from happening but using the time that is left. Now on to my big pile of print books! I put all the ones in a single pic, no matter how I got them. Shadowfever is the last one in the Fever series, it's not out in the matching edition to my other books, and I was DYING after a massive cliffhanger - luckily, my friend was all too happy to borrow it so we could discuss it afterwards ^^ I've already read it and it's a massive mindf*ck of a book!!! I like the way the series was rounded off but I still want to read Iced, the spinoff, asap! I've been staring at Prague Cemetery for a while and then I found it fairly cheap... I want to read about Prague again, and it sounds like mystery and secret societies and I love that stuff! I got Mara Dyer in the mail yesterday and I want to just devour it right now after loving the first book so much that I read it in a single day. As I said, big haul :) Have you read any of the books or do you have recommendations? I'd also love to check out what you got in the past week, so link me up! 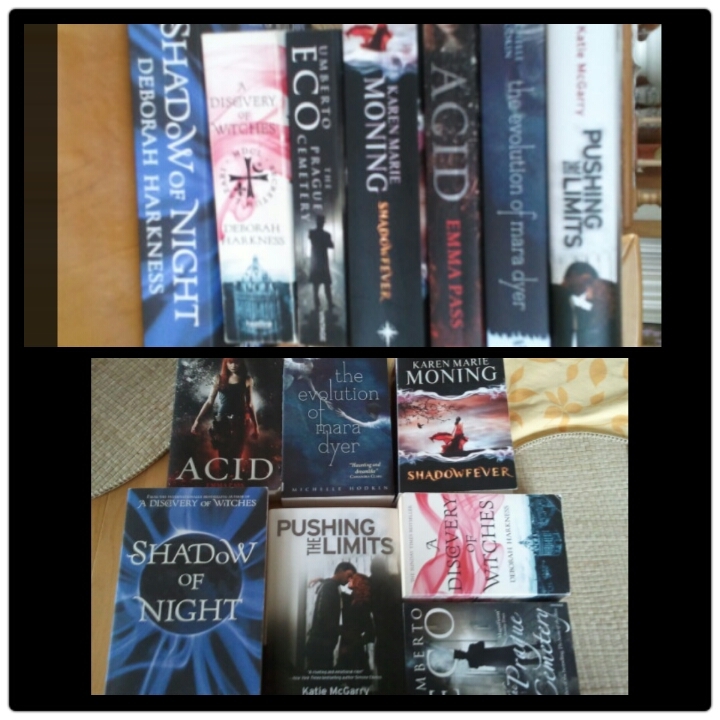 I love the covenant series and Mara Dyer :) And I'm really curious about Acid and Pushing the Limits! Great haul! Hardcovers are so pretty and nice. 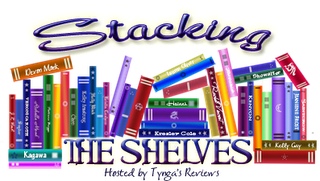 Pushing The Limits was one of my favorite contemporaries of last year. Oh my days! Acid sounds freaking awesome and I loved Mara Dyer #1 but haven't read #2 yet!! 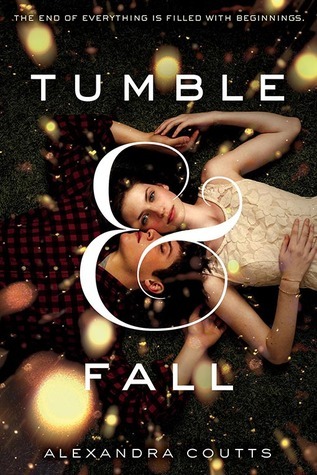 I am also majorly jelly of Tumble & Fall! *wipes drool from chin* *blinks* *recommences drooling* WOW, I freaking love this haul!! The Shadowfever edition you pictured there is the one matching my set and I'd never seen it before!!! I want it. Now. Glad you already read AND loved it - and I agree: total mindf*ck O.O Man that book had me re-reading bits of it and almost gave me whiplash more than once! Can you imagine that 'I' still haven't read A Discovery of Witches? I finally own it though since my B-Day so I MUST read it soon :D I am so pumped for you (mostly, I'm also super jelly lol) that you got ACID! ♥ Oh and I loved Half-Blood but I still need to read her Lux series so I don't know how they compare! Hope you'll love it too - and all the rest of these!! 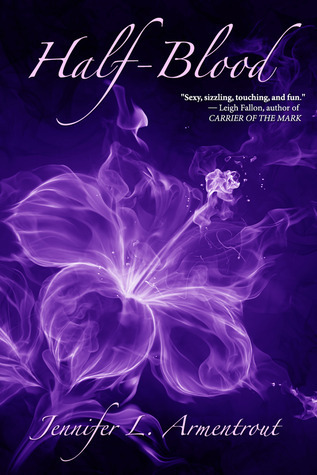 *wipes off your drool* The cover of Shadowfever does match those of my versions, but the format is different - higher spine :( But damn was it amazing! Waaaay more epic than I could've imagined! I'm defnitely re-reading that series at some point because it's one of those things where you realize it was allll planned out from the very beginning, you were just too blind to see it. I can't wait to see your BEA haul, by the way! Great haul! Shadow of Night and Half-Blood look especially good! Happy Reading! I love the Mara Dyer series. But then again, I love unreliable narrators. :) Can't wait for the final book this fall! I've never read anything by JLA, though I think I own the first book in the Lux series. I'd heard that the Covenant series was very similar to Vampire Academy, so I wasn't sure if I should pick it up or not. On one hand, I love VA, and on the other, I don't want to read a knock-off of that story line. Interested to see what you think. Have you read VA?